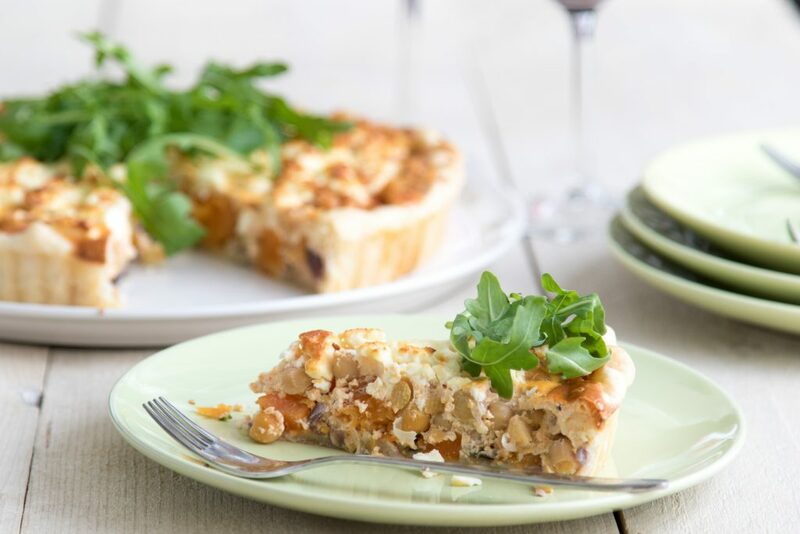 How do you make the chickpea quiche with pumpkin and feta? Soak the chickpeas for at least 8 hours and then cook them for 1,5 hours. Check whether they are done by tasting one. Then pour them off and set them aside. Preheat the oven to 180 ° C above / under and remove the dough from the refrigerator. Peel the pumpkin and cut it into pieces. Chop the red onions and finely chop the garlic cloves. Fry the onion and garlic in the pan with a little olive oil. Then add the pumpkin cubes and fry them for 5 min. Add the thyme at the end and briefly fry it. Roll out the quiche and cake dough and remove the baking paper. Then put the dough in a greased form. You can also put the dough into the mold with the baking paper, greasing is not necessary. Fold the edge of the dough so that the edge becomes thicker. Divide the pumpkin mixture over the dough and scoop the chickpeas on top. Mix the crème fraîche with the eggs, cayenne pepper and some salt and pour over the chickpeas. Then crumble the feta above the quiche. Bake the quiche at the bottom of the oven for 45-55 min. Until it turns golden brown. Garnish the quiche before serving with arugula. Tip: Do you want some extra spice in the quiche? You can also add fried bacon. Try goat cheese instead of the feta. 1 hours and 1 min.